Simply put, an easy, clean, good value for money hostel. Location is great and staff were kind. Very clean and comfortable stay. We loved the infrastructure and location of the hostel. 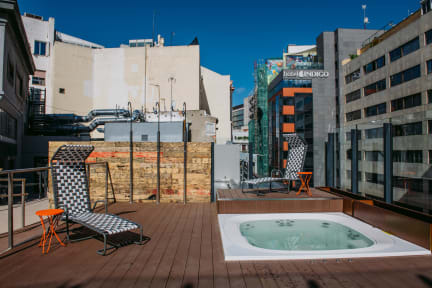 If you’ve stayed at a Generator Hostel before then this will meet your expectations. 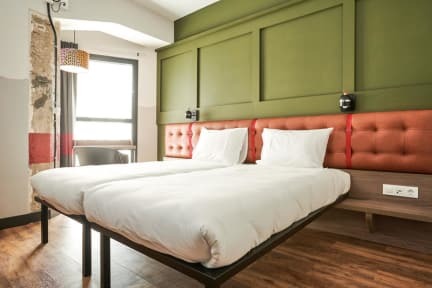 If you haven’t, this brand of hostels focuses on the aesthetic of the place and on being very easy for English speakers to use, but as a result is more expensive than other hostels. The towel rental was €5, and the cafe has dishes in the €10-15 range. If you are willing to hunt a bit you can pretty easily find higher quality food at a lower price. One of the best hostels I have ever stayed in! Overall very clean, safe and friendly! The terrace was beautiful as well. Breakfast wasn't included unfortunately and you had to pay to store your bags though. But other than that a great hostel! The hostel itself was super nice - great facilities! The space was lovely. However, I was really disappointed by the lack of common courtesy of other guests. The staff need to be clear about rules for polite usage of shared space. Guests in my room took phone calls in bed at full volume all night long. The guest in the bunk below me used his laptop the entire night. They chatted with one another at full volume. I slept from 8am to 9am and had a miserable stay, although the hostel itself is nice. It is a great place but it feels more like a hotel than a hostel! Nice hostel. Good location near Milano Centrale, but far from the city centre, takes about an hour to get to il Duomo walking. Good breakfast, it would have been nice to have some fruits, but either way was ok. The showers were not really clean. Absolutely superb location, right off the Gran Via. However, slightly pricey and does not include a kitchen, or even an electric kettle in the room or anything. And no outside food allowed.